It's not enough to write a great book. Authors are now expected to play an active role in book marketing and promotion. In this brave new world of always-on media, scribes are expected to either pursue or make themselves available to every potential reader. Though there have always been opportunities for interviews, reviews, in-store signings, book fairs, seminars and broadcast appearances, now publishers want to make sure no avenue for multimedia exposure is overlooked as a book competes with every other form of entertainment. Most book companies have full-time staff devoted to pursuing publicity for their books and authors, but nothing is guaranteed. 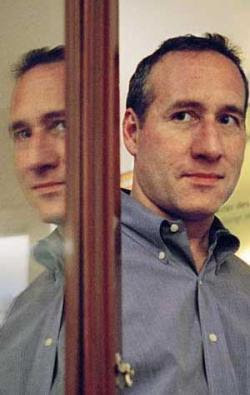 "Publicity departments are too small and stretched too thin," author Joseph Finder (pictured above), author of "High Crimes," "Company Man" and "Paranoia," said in a telephone interview from his Boston office. "They do their best, but there’s always another book coming out and I want to make sure that mine gets the attention it deserves before they move on to the next one." But he notes his publisher, St. Martin’s Press, "was extremely cooperative when I came up with the idea of including an audio CD” to promote his current book, “Killer Instinct.” “From the CEO on down, they’re totally behind my books. In fact, the marketing director is a fan," he said. Making that connection also includes putting up special Web sites in countries where his books sell especially well, such as the Netherlands. Edna Buchanan, a Miami Beach novelist and one-time Pulitzer Prize-winning crime reporter for The Miami Herald, said she works closely with her publisher’s publicity department and will do book tours and almost anything else they suggest to sell her books. "But I hate to leave Miami," said Buchanan. "I’m basically a shy person but also I don’t want to miss anything if I’m out on the road. Plus I don’t like to go anyplace where they only speak one language and don’t have Cuban coffee." But with her new book, "Love Kills," which brings her recurring character Britt Montero together with the Cold Case Squad, due out in June, she expects to hit the road again if that’s what her publisher wants. Lissa Warren, senior director of publicity for Da Capo Books, which is based in Cambridge, Mass., said authors should first try to figure out how much of a priority their book is to the publisher. "Is it in their catalog, and if so, how does it compare to other books? Is there a two-page spread? Is there a large print run? A big advance? A tour? Have they sent out galleys to reviewers?" are the questions that should be asked, she said. "They should at least be able to secure reviews from the Big Four trade publications — Publishers Weekly, Kirkus Reviews, Booklist and Library Journal — too,” said Warren, a poet herself and author of "The Savvy Author’s Guide to Book Publicity: A Comprehensive Resource: From Building the Buzz to Pitching the Press.”"
"Some authors may initiate their own campaigns, often with the knowledge and blessings of their publisher, but sometimes without," Warren said, adding that independent public relations firms may also be hired to work on a project. "It’s big bucks," said Les Standiford, author of the series of novels featuring South Florida-based sleuth John Deal, as well as several historical works, including “Meet You in Hell: Andrew Carnegie, Henry Clay Frick, and the Bitter Partnership That Transformed America." "The plain fact is that in an industry where $25,000 is a substantial advance, after your agent’s commission, taxes and a little money to live on, how much is left? My publishers have always been collaborative and like to see me tour and do signings, but do you know how many books you usually sell at a signing?" he asked. “Six to eight." "So if you do a 10-city tour with average expense of a thousand dollars a day, how much does that work out to be, per copy?" Standiford, who heads the creative writing program at Florida International University, chuckled and added, "But the publisher thinks it’s worth it and that it helps with word of mouth, which is how most books sell anyway. I’m fine with that, because it’s the most valuable and effective thing I can do to help sell my books." Does Standiford teach his FIU students how to promote their work? "No," he said. "That would be more of a business course, I’d imagine, but we do cover how to present material to an agent, which is an important step in the process." Investigative author Edwin Black, who wrote “IBM and the Holocaust,” “War on the Weak” and “Banking on Baghdad,” is a skilled and tireless promoter for his books. After conducting the substantial research behind his current book, "Internal Combustion" — which chronicles the history of the energy industry and the suppression of alternate technologies, Black became a road warrior. "Publishers know that in addition to getting a book, they’re getting me," he said several weeks ago while in Broward County to launch the campaign for “Internal Combustion." "I’m out there, meeting with people at schools, organizations and other places that make sense." Black, who lives in Washington, wrote and helped produce a video trailer for his book that was completed with the assistance of volunteers, packaged on DVD and distributed online through YouTube. He also works with his publisher to secure reviews in print publications, as many authors do. Major online booksellers such as Amazon.com and BarnesandNoble.com also get into the act by inviting customers to contribute reviews and some have become quite prolific, with devoted followings. But there are no editors or gatekeepers to ensure the authenticity of the reviews and the legitimacy of the reviewers. Political books, for example, are often critiqued on the basis of the author’s personality or party affiliation rather than the content of the work in question. By far the most influential television venue for books is Oprah Winfrey’s syndicated weekday show. Her mere mention of a title sends thousands to bookstores. "When that happens, publishers have to make sure that there are books in shops to capitalize on it," said Da Capo’s Warren. Some authors are particularly savvy about using the electronic media to promote their work. Prolific British fantasy writer Warren Ellis ("Planetary," "Transmetropolitan," "Fell"), sends short email messages several times a week, under the heading “Bad Signal,” to fans and others who sign up to receive them. He comments on life, asks questions that come up as he writes his stories and scripts, and announces upcoming projects as well as on-sale dates of books. He even mentions quantities of distributor stock since a number of retailers and other professionals are also on his list. Ellis rarely makes personal appearances, but his postings to his own website and on other online venues project a presence well beyond his British home base. Writer and marketing guru Seth Godin’s books are often accompanied with clever marketing campaigns. A colorful cereal box, boldly announcing, Free Prize Inside, contained not a decoder ring or tiny plastic soldier, but a copy of Godin’s book of the same name. Each of his books is foreshadowed and accompanied by a flurry of online promotions, special offers, podcasts, and blog postings from myriad Web sites. Godin, who lives outside New York City, is also a frequent speaker at seminars and conferences and has deftly managed to keep his message consistent while offering fresh nuances and new insights to cultivate and retain a devoted following. In response to an e-mail asking about how he markets his books, Godin wrote: "The unspoken truth is that except for perhaps 250 giant books every year out of 75,000 published, the publisher is expecting the author to do 100 percent of the sales and promotion. Because authors don’t understand that, they end up bitter, angry and perhaps destitute. "The most successful authors drive from store to store in a sort of perma-tour, selling books out of the back of their car or just working with individual stores to make their titles stand out," he wrote. "Oliver North made hundreds of thousands of dollars selling his remaindered autobiography at speeches to right-wing groups. This approach is antediluvian and time-consuming, but it works." Godin said he works closely with his publisher, Portfolio, to create and market his books. "Once we hammer out a plan, they do a terrific job in supporting it. There are other publishers who are far more conservative, far more certain that the tried and true is the only path. The problem with that approach is that it is wrong," he wrote. Godin said he doesn’t have a blog to sell books — but rather to spread ideas. "I don’t flog the blog that hard, which certainly costs me short-term book sales. But that’s OK, because the point is to keep the ideas moving around. I think it’s pretty safe to say that the investment in the blog has certainly paid off in increased book sales over time," he wrote. His advice to authors is to get out and really work for their books: "You need a platform to make a published book work. If you don’t have a platform yet, you should self-publish your first book and give away enough copies to get a platform, and then use that platform to engage your readers so that you can sell the second one to a publisher and quit your day job." Excellent post, and as far as I can tell, absolutely true and incredibly valuable for aspiring authors. The industry has changed dramatically since my first book came out in 1994. I chose the publisher for my next book because they are a boutique outfit (only 55 titles a year) and want to work with me to leverage my platform for the success of the book. I'd love to do an interview with you for my next book. I think you have a handle on some key ideas. Interested? Reach me through my URL!